It’s common for people to get confused about the difference between flyers, leaflets, brochures, and pamphlets, considering how they all appear to serve the same purpose. But in the world of printing and type of marketing, each communication device has its own distinctive feature and function that not all of us know about. While there may be conflicting beliefs and arguments with how these are used, we can all agree that understanding its exact role in advertising can help us develop efficient and effective promotional mediums. Before we determine just how different flyers, brochures, leaflets, and pamphlets are from one another, we must first expand our knowledge on what these adverting tools are, along with how they function. Promotional flyers are known to be one of the cheapest advertising tools in the industry. It is often used for small-scale marketing, considering how you can only cover so much about your business or organization with the ad space available. Information may be printed on one side or both sides, depending on how the flyer will be presented to the market. 1. Announcing special events to the public, such as through summer flyers, charity flyers, and other event flyer examples. 2. Providing product details. This includes product specifications, availability, and its selling retail price. 3. Relaying facts and other business information that prospects may be interested in. This is common at conferences, conventions, and trade shows. You may also like multipurpose flyers. 4. Local advertisements, specifically for a targeted group of people within an area. Unlike flyers, brochures can be a bit more costly to produce. A brochure consists of multiple panels that each hold significant information that an advertiser wishes to relay. For some, a brochure contains features that are comparable to a book or magazine. What makes a brochure a good communication device is how it allows you to disseminate important information effectively. Even with the limited amount of space available for text elements, you still have enough to keep the document as informative as possible. 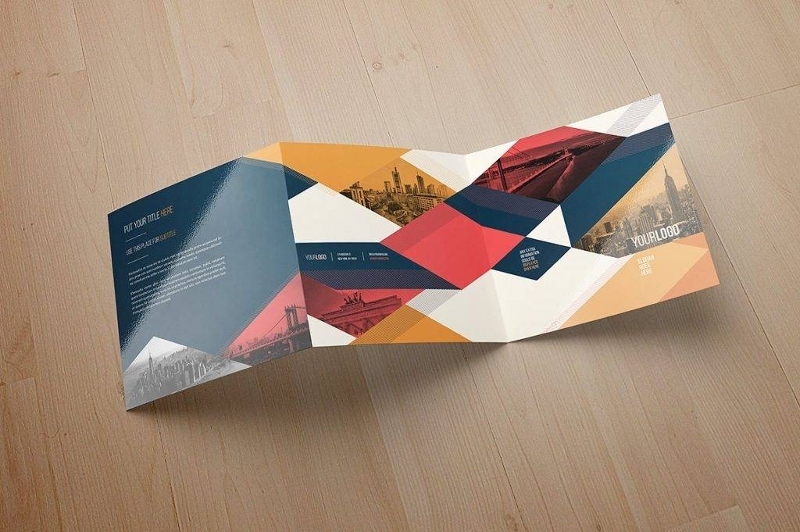 Marketers may even get creative by experimenting with the panels to form an overall look and tone of the brochure design. 1. Giving comprehensive details about a brand, product or service. 2. Supplying additional information that has been seen on a marketing flyer. 3. A reference material for employees and customers to take advantage of. 4. Closing a deal or sale. 5. Starting a direct mail campaign as a follow-up to a corporate postcard subscription. Leaflets can often be mistaken for flyers, considering the similarities they hold in terms of form and purpose. But because leaflets tend to be of higher quality compared to the average paper flyers, they are bound to cost more in print production. But don’t worry, the color payoff of your leaflet is sure to attract some attention. You may also like minimal flyer designs. 1. Piquing a prospect’s curiosity and interest in your business. 2. Promoting a product or service briefly to potential customers. 3. Quick and easy information dissemination in the form of hand-outs and newspaper inserts. A pamphlet is a lot like a booklet, except for the fact that it doesn’t have a hardcover nor a binding for it to be considered as one. Many companies, non-profit organizations, event coordinators, and politicians opt to use pamphlets instead of a campaign flyer to provide a full detailed description of themselves. Some would even consider it as a single-subject leaflet that portrays one topic throughout the publication. 1. Informing and educating a target audience. 2. Advertising a meeting or event happening in the near future. 3. Emphasizing your company slogans and messages to develop strong branding. One of the biggest debate that continues to exist in the world of print media is what differentiates a leaflet from the average flyer. We’re all guilty of using these two terms interchangeably, but that’s because they both have the same characteristics. Flyers and leaflets are essentially used for advertising and they are both a disposable type of marketing tool. However, if you have an exceptional eye for design then you may have noticed the slight difference between the two. For instance, flyers come in an A6 paper with brightly-decorated designs. Although you may find leaflets to be the same, they actually bear a more professionally-designed type of tone. The weight of the paper that these leaflets are printed on is also rather different, usually A4 or A5. You may also like business flyer examples. Now you must be wondering, which type of document would be the most ideal for me? Some experts would say that pizza flyers and nightclub flyers are suitable because of the type of business being run. Corporate businesses, on the other hand, may want to consider using leaflets to communicate with their prospects. But don’t take this the wrong way, as you always have the option of using multiple means of advertising regardless of the nature of your business. You may also like party flyer examples. If you put a brochure and a pamphlet side by side, you can’t tell much of a difference based on their appearance. They both seem like leaflets being printed on a single sheet of paper and then folded into various sections. But you see, the only significant difference between the two is how they are intended to be used. Think about the message you want to get across to your audience. Anything from the titles, subtitles, headings, images, texts, and diagrams are the details you need to consider when deciding between the two mediums. You may also like differences between a brochure and a pamphlet. Brochures typically relay brief and summarized details that serve as an introduction to a brand, product or service. They are also printed on single sheets and then folded in half or thirds. They can often appear loud and colorful since they are made to attract the most attention to prompt an immediate reaction from a client. On the contrary, pamphlets are meant to be an educative and informative reading material. You may also like best brochure examples. They are sometimes used as reference materials and manuals for political campaigns and appliance setups. But because of the number of details being presented in a pamphlet, it isn’t a popular option for advertising goods in the market. They aren’t as “out there” as brochures are either, nor do they need to be printed using a high-quality paper material. In fact, pamphlets are said to be ideal for non-commercial use because of how it focuses on a single topic. You may also like business brochure examples. While this may not be much of a big deal to some, identifying the difference between these marketing mediums may just leave you with a good peace of mind. The only significant factor to take note of is the price difference in printing, as VAT can be applied differently to each device. Knowing the difference between such devices will help you achieve success when selling your products and services. Now that you are familiar with the definitions and the applications of flyers, leaflets, brochures, and pamphlets, maybe this time, you won’t be up guessing which medium would suit you best. You may also like tri-fold brochure designs.